Since Dante Alighieri wrote his masterpiece, The Divine Comedy, between 1302 and 1322 many artists have attempted to visually interpret it through drawings and paintings. However, to this date only one artist has interpreted it correctly according to Italian Dantologists, Sandro Botticelli in the 1480's, over 500 years ago. On the other hand, the most notorious work was done by Gustave Dore 150 years ago and much later Salvador Dali, just 50 years ago. The art seen here by Dino Di Durante, however, is neither the black and white Dore's lithographs, nor the abstract Dali's paintings, instead he offers a rich set of colorful carefully crafted paintings never seen before. Durante's focus is not only an accurate interpretation of Dante's masterpiece, but also his passion to influence teenagers so they can have an early understanding of Dante's teaching about life through The Divine Comedy. Dino Di Durante's visual journey of Dante's Inferno started in 2007, with the idea of making a comic magazine. 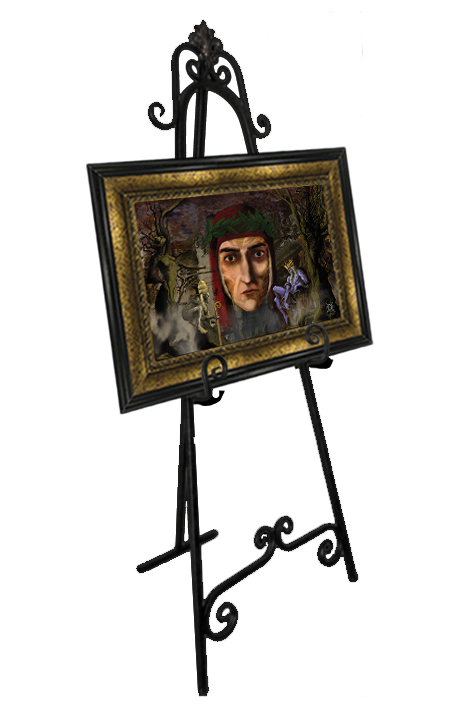 This idea expanded into a book of illustrations, and later to an animation film where most of the painting come to life in Dante's Hell Animated, now available on DVD . These 72 unique pieces of art are also part of a two-hour long documentary , titled Inferno by Dante, featuring over 30 celebrities, professors and Dantologists (Dantisti) from both the United States and Italy, which is also in its final stages of post- production. Dante's Hell Animated was screened, as a work-in-progress, in May, 2010 at the Cannes Film Festival in France and the Italian version, Inferno Dantesco Animato in May 2012 at this same world prestigious film festival. In addition, this art collection premiered as a work-in-progress (50 pieces) at the Pablo Atchugarry Foundation from January 12 to February 28, 2011. We profoundly thank Pablo Atchugarry Foundation and the following sponsors for their support, collaboration, and mainly recognition of Dante Alighieri's influence in the arts and world culture as a whole: Mantra Resort, Posta del Cangrejo.